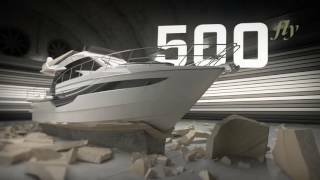 The award-winning Galeon 500 Fly is the most innovative yacht in its class. 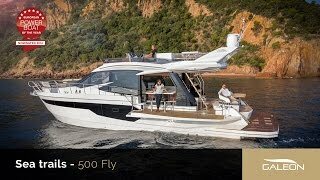 With all the luxury and craftmanship that Galeon is known for, the 500 Fly offers ingeniously unique features that make it an incredible investment in your boating lifestyle. With it’s unique “beach mode”, the cockpit width extends to a stunning 20 feet by dropping down both the port and starboard coaming sides. The bow rest area comes with an expansive C-shape seating area for additional entertainment space. Up top, the sizable flybridge is fitted with a wet bar, sundecks and a second helm station for easier maneuvering. With a powerful hydraulic swim platform available, you can choose to transport a variety of engaging water paraphernalia. From the ample flybridge to the large staterooms, the Galeon 500 Fly is engineered to please and excite even the most demanding yacht aficionado while providing an awe inspiring experience for family and friends. The main deck reveals a closely linked saloon and cockpit areas with a flush floor and sliding side windows. Serve refreshments straight from the galley or even set up an outside bar to your guests amazement. A bright interior of the saloon is also fitted with leisure and dining areas as well as a functional helm station with great visibility. With powerful Volvo engines in an inboard V-drive confirguration and available high-tech electronics and navidation equipment, the 500 FLY provides comfort and reliable for all of your adventures. Down below, three cabins and two bathrooms await the passengers for a total of six berths. The master cabin, located midship, offers a double bed, large wardrobe and a private bathroom. Offer your guests the bow VIP cabin for spectacular night views thanks to a series of skylights. All quarters offer standing height and have access to natural light. The sumptuous master stateroom is the ideal space for privacy at the end of a day full of socializing and adventure. 1481 E. Hill Park Rd.